An artist's depiction of an early stage in the destruction of a "hot Jupiter" (a gas giant with a very close orbit) by its star. Most of the big, super-hot alien planets that astronomers are searching for in old star clusters may have been destroyed long ago, a new study suggests. "Planets are elusive creatures," said study co-author Brian Jackson, a NASA postdoctoral fellow at Goddard Space Flight Center, in a statement. "And we found another reason that they're elusive." When astronomers began searching for exoplanets in star-packed globular clusters a decade ago, they hoped to find many alien worlds. For example, one survey of the cluster called 47 Tucanae (47 Tuc for short) was expected to identify at least a dozen planets among the 34,000 candidate stars. But the astronomers came up empty-handed. Researchers say there are several possible reasons for this failure. First, globular clusters are rough neighborhoods for planets. The high density of stars in clusters means that planets can be kicked out of their solar systems by nearby stars. Also, 47 Tuc and other star clusters surveyed so far have have had low metallicity. They lack metals ? elements heavier than hydrogen and helium ? which are the raw materials for making planets, researchers have said. The new study proposes another explanation to go along with these: 47 Tuc, and clusters like it, may once have harbored hot Jupiters ? gas giant planets with orbits at least three times closer to their parent stars than Mercury is to the sun. But tidal forces destroyed them long ago. In the cramped orbit of a hot Jupiter, the researchers say, the huge planet's gravitational pull can create a tide ? that is, a bulge ? on its parent star, much as the moon's pull causes ocean tides on Earth. As the planet orbits, the bulge on the star points a little bit behind the planet and essentially pulls against it. 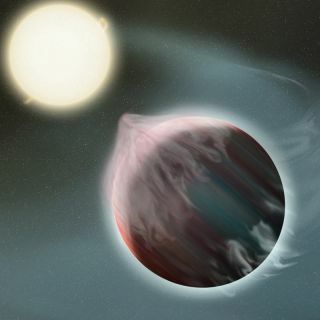 This drag reduces the energy of the hot Jupiter's orbit, and the planet moves a little closer to its star. This causes the bulge on the star to get bigger and sap even more energy from the planet's orbit. This process ? termed tidal orbital decay ? continues for billions of years, until the planet crashes into the star or is torn apart by the star's gravity, researchers say. "The last moments for these planets can be pretty dramatic, as their atmospheres are ripped away by their stars' gravity," Jackson said. Jackson and co-author John Debes, also a NASA postdoctoral fellow at Goddard, modeled what may have happened around stars in the 47 Tuc cluster if their tidal effects were unleashed on hot Jupiters. They recreated the range of masses and sizes of the stars in that cluster and simulated a likely arrangement of planets. Then they let the stars' tides go to work on the close-in planets. The model predicted that so many of these planets would be destroyed, the survey would come up empty-handed. "Our model shows that you don't need to consider metallicity to explain the survey results," Debes said, "though this and other effects will also reduce the number of planets." The model Jackson and Debes came up with predicts that one-third of a cluster's hot Jupiters should be destroyed by the time the cluster is 1 billion years old. This is still relatively young when compared to our solar system, which is about 4.5 billion years old. The 47 Tuc cluster, on the other hand, is likely more than 11 billion years old. At that age, the researchers expect more than 96 percent of its possible hot Jupiters to be long gone. Kepler will survey four open clusters ? groups of stars that are not as dense as globular clusters ? ranging from 500 million to nearly 8 billion years old. All of the clusters have enough raw materials to form significant numbers of planets, Debes said. If tidal orbital decay is occurring, Kepler could find up to three times more Jupiter-size planets in the youngest cluster than in the oldest one, Debes and Jackson predict. An exact number will depend on the brightness of the stars, the planets' distance from the stars and other conditions. And if the model pans out, planet-hunting in clusters may become even harder, Debes added. "The big, obvious planets may be gone, so we'll have to look for smaller, more distant planets," Debes said. "That means we will have to look for a much longer time at large numbers of stars and use instruments that are sensitive enough to detect these fainter planets."